The results of two long-term field trails in Washington State (The Rest of the Story: Take-all Decline with Continuous Wheat Monoculture) provided unequivocal evidence that take-all of wheat caused by the soilborne fungus Gaeumannomyces graminis var. tritici (see ) increases in severity to a peak and then declines as the soil becomes microbiologically suppressive to the disease with years of continuous wheat monoculture. These results laid the foundation for David Weller, Linda Thomashow and me as members of the USDA-ARS Root Disease and Biological Control Unit at Washington State University to explain this natural biological control. Weller isolated a bacterium from a wheat root growing in suppressive soil from the Lind plot that he identified as Pseudomonas fluorscens, and showed in the greenhouse that it provided biological control of take-all when introduced on the wheat seed at planting. He labeled the isolate 2-29 because it was the second strain isolated from this suppressive soil in 1979. First of many field tests with strain 2-79 unmodified. Weller and I went on to show that 2-79 applied as a seed treatment also provided a significant level of control of take-all in the field as shown in the photo below. In this example, we fumigated an area with methyl bromide to eliminate naturally occurring inoculum of the take-all pathogen and other wheat root pathogens and then set up four replicates of each of the treatments A, B, and C. Treatment A was a check of wheat grown with neither strain 2-79 introduced on the seed at planting nor the take-all pathogen added to the seed furrow at the time of planting. For treatment B, the seed was treated with 2-79 and the take-all pathogen contained in oat grains as a food base was added to the soil at the time of planting. For treatment C, the take-all pathogen was added to the seed furrow at the time of planting but without 2-79 added to the seed. The severe stunting of the wheat in treatment C was due to take-all on the roots, whereas the same amount of pathogen inoculum add to the seed furrow at planting produced only mild disease when strain 2-79 was introduced on the seed where it was then poised to colonize the roots and protect them again take-all. Read Abstract here. Thomashow and Weller went on to show that strain 2-79 produces the antibiotic phenazine-1-carboxylate that was inhibitory to the take-all pathogen on agar media, but this did not prove that the antibiotic accounted for protection of roots by this strain in soil. In classic research using the tools of rDNA technology, also known as genetic engineering, Thomashow and Weller showed that when a key gene needed by 2-29 to make the antibiotic was knocked out by transposon mutagenesis, that genetically modified version of 2-79 no longer controlled take-all when applied as a seed treatment. In contrast, when the mutant strain was restored in ability to produce phenazine-1-carboxylate by complementation with a functional gene introduced into the strain 2-79;s genome, that strain was coordinately restored in ability to control take-all when applied as a seed treatment. Many if not most antibiotics used in medicine are produced by microorganisms isolated originally from soil or plant parts. However, microbiologists had long wondered and debated whether the ability of a microorganism to produce an antibiotic happens in soil or only in laboratory cultures. The results from the research by Thomashow and Weller provided the first unambiguous evidence that production of the phenazine antibiotic by 2-79 happens in soil and not just in laboratory culture. They and WSU chemist Bob Bonsall would go on to eventually isolate phenazine-1-carboxylate directly from the rhizosphere of wheat. Not surprisingly, strain 2-79 and other strains of P. fluorescens with ability to produce phenazine antibiotics would be only the “tip of the ice-burg” of all that goes on microbiologically in take-all suppressive soil. Continuing their search, Weller and Thomashow discovered another population of P. fluorescens with ability to produce the antibiotic 2,4-diacetylphoroglucinol and showed as they had for strain 2-79 that mutants for a key gene needed to make that antibiotic were no longer able either to produce the antibiotic or control take-all in the rhizosphere whereas the same strain but restored in ability to make the antibiotic was also restored in ability to control take-all. Subsequent research by the Weller-Thomashow team has shown that the build-up of phloroglucinol-producing strains accounts for take-all decline with long-term wheat monoculture, and the build-up of phenazine-producing strains plays a role in suppression of Rhizoctonia root rot with long-term wheat or barley monocultures. 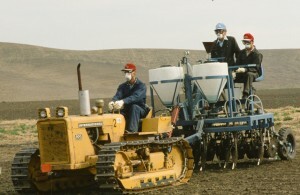 In 1988, after conducting numerous field trails with strain 2-79 and other antibiotic-producing strains for biological control of take-all, the USDA-ARS Root Disease and Biological Control Unit was presented the opportunity by Monsanto Company to help test a genetically engineered tracking system that could monitor the survival or movement of virtually any microorganism introduced into soil or other environment. This was of great interest since we had no way when isolating bacteria from the rhizosphere of wheat to distinguish our introduced strain from the thousands of other indigenous bacteria that looked just like our strain when cultured on agar media. This tracking system, developed by a team led by David Drahos, involved introduction of two genes from E. coli required for metabolism of milk sugar (lactose) and known by the symbol LacZY. 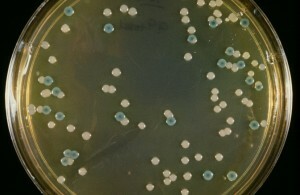 Bacterial colonies produced from cells containing these two genes turn blue on agar media (see photo) specifically designed for growth of P fluorescens but also amended with the chemical, X-Gal. It was assumed quite logically that since soil bacteria were not exposed evolutionarily to milk, it would be unlikely that indigenous strains of soil bacteria would already have these two genes in their genome. We agreed to the Monsanto proposal and a three-way agreement was reached between the USDA-ARS, which owned strain 2-79, Monsanto, which owned the LacZY tracking system, and WSU, which owned Spillman Agronomy farm where the field release would take place. This would be the first field-release of a genetically engineered organism in the U.S. Pacific Northwest and the second field test of a strain of P. fluorescens engineered to express Monsanto LacZY tracking system. The first test with the tracking system was done earlier in fall of 1987 in cooperation with the Clemson University, the objective being simply to gain experience with the tracking system. Since no claim of biological control was made for the strain released in the Clemson study, federal approval was obtained from the U.S. Environmental Protection Agency under authority of the Toxic Substances Control Act (TSCA). However, because strain 2-79 was intended as a biological control agent, and because the EPA considers all microbial biocontrol agents as “microbial pesticides”, EPA approval for the field release of the engineered 2-29 was required under authority of the Federal Insecticide, Fungicide and Rodenticide Act (FIFRA). In fact, we ended up with six different approvals, including a courtesy approval from USDA under the Plant Pest Act, a courtesy approval from the Washington State Department of Agriculture, and required approvals from the Institutional Biosafety Committees of each of WSU, USDA-ARS and Monsanto. In early 1987, after a 4-year delay because of litigation and delays in government approvals, a strain of Psuedomonas syringae known as “ice-minus” became the first field test in the USA or possibly anywhere with a genetically engineered organism. The indigenous and ubiquitous wild-type P syringae live on leaves and have the ability to initiate ice formation (and hence frost damage) in super-cooled water (down to -9 C). Frost injury, in turn, opens avenues for colonization of the leaf tissues by P syringae and hence more damage to the foliage. The ice-minus strain was a mutant produced by transposon mutagenesis just as done later by Thomashow and Weller with strain 2-79. The goal of the field release, first on strawberries and then on potatoes, was to determine whether a strain with all the characteristic of the wild-type but unable to initiate ice formation, could through preemption and competition for sites prevent colonization of leaves by the wild type and hence prevent or limit frost injury. Whereas the team from Advanced Genetic Sciences that conducted the test with strawberries, and the team representing the University of California Berkeley that conducted the test on potatoes had to wear “moon suits” and gas masks that left no part of their bodies exposed, our team was allowed to wear standard work coveralls, dusk masks, goggles, gloves and rubber boots. On the other hand, because of the 4-year delay in the California trials, owing mainly to lawsuits brought by private parties opposed to biotechnology, and which in turn only further delayed EPA and USDA approvals, every effort was made well in advance of EPA approval (and with no guarantee of EPA approval) to inform public and elected officials of the plans for and purpose of our field release. This included visits with staff of the governor of Washington, all elected representatives and senators from Washington State, the Whitman Country Commissioners, Pullman City Council, dean and staff of neighboring University of Idaho College of Agriculture just 8 miles from Spillman Agronomy farm, and relevant state agencies in Olympia, Washington. I even hosted a breakfast for the farmers whose land bordered on Spillman Agronomy farm so they would not be surprised by all the media interest and presence anticipated on the day of the release. Finally, and still with EPA approval still pending, we invited six legislators from eastern Washington districts to a seminar given by Linda Thomashow in the WSU Department of Plant Pathology that explained what had been done that makes the strain “genetically engineered” and what we expected to learn with our planned field test. To wrap up the session, a sheet cake was provided with white icing and the LacZY construct illustrated with blue icing. And everyone helped eat it. EPA approval came in late October 1988, early in the week we had planned (and hoped) to plant wheat with seed treated with the engineered 2-79. Dennis Brown with WSU Information notified the media immediately of the day that the trial would be initiated. The trail was conducted on a fairly level area of bottom land that had been planted to research plots of peas and lentils that year, which made it easy to prepare a seedbed for wheat. Because of the rotation to the legumes, we expected little if any natural take-all and therefore we introduced the pathogen as colonized oat grains identical to the inoculum source used to produce the disease in greenhouse pots and the field trial illustrated in treatments B and C in the photo above. This was accomplished by “planting” the colonized oat grains 3-4 inches deep one day, and wheat seed with and without 2-79 on the seed the next day, using the same eight-row plot seeder (see also: The What and Why of the Paired-Row Effect on Yields of Cereals). Individual plots were eight rows wide and 20 feet long, with rows spaced uniformly at 12 inches apart. A cone positioned directly under a funnel and supported above the center of a shallow rotating cylinder. This rotating cylinder, in turn, served to distribute the colonized oat grains (or wheat seed) uniformly around the perimeter of the cylinder set to rotate fast enough to deliver all seed into tubes leading to the openers exactly over the 20-foot length of the plots. This equipment allowed us to introduce the exact same amount of inoculum in each 20-foot-long plot, or travel the 20-foot-length of a plot with no inoculum introduced, thereby providing pathogen free checks as done for treatment A in the photo above. It also allowed us to introduce a different seed treatment in each 20-foot-long plot. Two levels of pathogen inoculum placed 3-4 inches deep were used to help insure that one level would provide the right disease pressure for the test. The wheat seed was placed about 2 inches deep in a second pass with the tractor driver making sure that the wheat seed was planted precisely in the rows containing the pathogen inoculum. The day of the release started with a conference on the loading dock of a main building on Spillman Agronomy farm and then everyone moved to the site where the equipment and packets of seed was ready for planting. Dumping a different packet of seed through the funnel and into the rotating cylinder every 20 feet while on the move and with no mistakes requires total concentration. 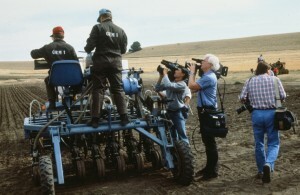 Normally it was my job to ride the planter, but on that day, and with TV and newspaper journalists from as far away as Seattle, that job went to a bright young undergrad while I watched standing on the planter. From the public relations standpoint, and with no challenge to the test, we concluded that either our careful attention to informing elected and appointed officials prior to the test paid off, or the public was no longer concerned after the court battles over release of ice-minus P syringae in California. Newspaper and TV coverage were accurate and not particularly sensationalized. Nor should any test as benign as 2-79 engineered to express a trait that allowed us to track it have been sensationalized. Scientifically, we learned that the strain as expected spread downward on the roots as they grew downward. 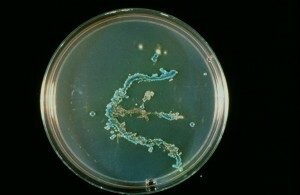 The photo below shows the growth of the LacZY-engineered 2-79 following a root imprint made on the agar media, showing that the bacteria was present the full length of the seedling roots. On the other hand, more careful analyses by Weller showed progressively lower populations of the introduced 2-79 at increasing distances from the seed. Subsequent strains of P. fluorescens isolated by Weller from wheat roots growing in take-all-suppressive soil have proven to be considerably more “rhizosphere competent” than strain 2-29. We found no evidence that the introduced strain on roots of wheat moved from the outside row of a treated plot to the outside row of an adjacent non-treated plot 12 inches away. On the other hand, the marked strain was isolated from roots of weeds or volunteer lentil seedlings growing in rows planted with treated seed. The most significant finding was that the introduced strain was no longer detectable once the wheat had matured and was harvested. From the standpoint of future trials, we discovered that a packet of nontreated seed when passed through the planter immediately following a packet of treated seed picked up enough of the bacteria to be questionable as “non-treated”. Subsequent trials have included a plot planted with untreated seed prior to every untreated check, to reduce the amount of carryover bacteria in the planter seed tubes and openers.